This article answers four common questions teachers have about vocabulary instruction, including what words to teach and how well students should know vocabulary words. 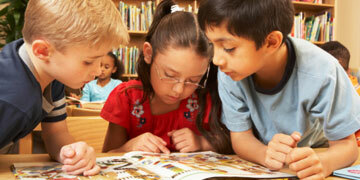 The second way to promote indirect learning of vocabulary is to encourage students to read extensively on their own. Rather than allocating instructional time for independent reading in the classroom, however, encourage your students to read more outside of school. Of course, your students also can read on their own during independent work time in the classroom — for example, while you teach another small group or after students have completed one activity and are waiting for a new activity to begin. Direct vocabulary instruction can take a lot of class time — time that you might better spend on having your students read. You will probably to be able to teach thoroughly only a few new words (perhaps eight or ten) per week, so you need to choose the words you teach carefully. Focus on teaching three types of words: important words, useful words, and difficult words. Words with multiple meanings are particularly challenging for students. Students may have a hard time understanding that words with the same spelling and/or pronunciation can have different meanings, depending on their context. Looking up words with multiple meanings in the dictionary can cause confusion for students. They see a number of different definitions listed, and they often have a difficult time deciding which definition fits the context. You will have to help students determine which definition they should choose. Click here for some examples of words with multiple meanings. Are there different types of word learning? If so, are some types of learning more difficult than others? The student has the word in her oral or reading vocabulary, but she is learning a new meaning for it. For example, the student knows what a branch is, and is learning in social studies about both branches of rivers and branches of government. The student is familiar with the concept but he does not know the particular word for that concept. For example, the student has had a lot of experience with baseballs and globes, but does not know that they are examples of spheres. The student is not familiar with either the concept or the word that represents that concept, and she must learn both. For example, the student may not be familiar with either the process or the word photosynthesis. The student is learning finer, more subtle distinctions, or connotations, in the meaning and usage of words. For example, he is learning the differences between running, jogging, trotting, dashing, and sprinting.